The new synthetic turf will enable the ballpark to host a wider range of events and increase the ROI for the City of Grand Prairie. GRAND PRAIRIE, Texas (November 29, 2012) - Next year, the Grand Prairie AirHogs will start their baseball season on synthetic turf. The Matrix® Turf system that is currently being installed at QuikTrip Park will reduce the maintenance cost and increase the use of the 145,000 square-foot minor league ballpark. Hellas Sports Construction crews hit the ground running and have already begun installing the integrated drainage system and base stone. The expedited construction is set to complete in early 2013. When all is said and done, fans and athletes will notice field upgrades that go above and beyond the drainage. 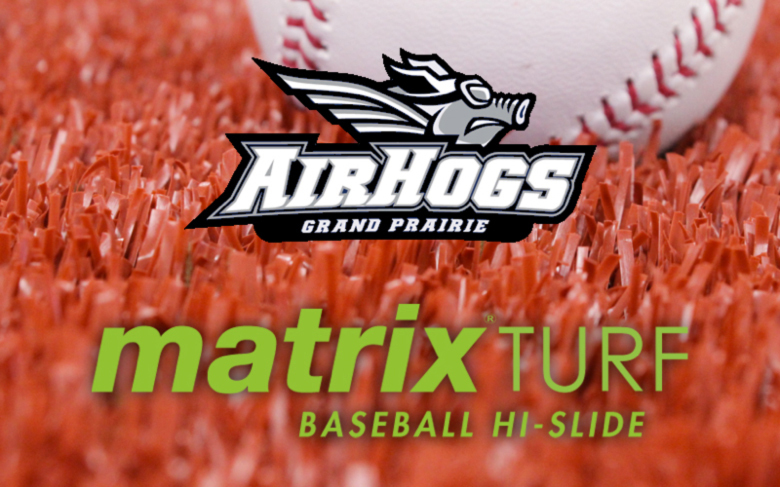 Matrix Turf will be the new playing surface for the Grand Prairie AirHogs, and visiting teams of the ballpark. The innovative synthetic turf system will feature Hellas¹ proprietary artificial grass with a pile height and backing weight designed specifically for baseball fields. The landscaped areas off the field will be turfed with Hellas’ Grasso Sportscape – a plush synthetic turf designed to reduce water usage and maintenance costs by replacing the natural grass areas that often complement sports fields. In addition to AirHogs baseball games, QuikTrip Park will be able to host a wide range of new events, concerts and tournaments, including the 2013 Western Athletic Conference baseball championship. QuikTrip Park’s Matrix Turf is designed to be utilized day-in-day-out and under weather conditions that would previously limit field use on the old natural grass baseball field. “The natural grass field couldn't handle that many games, where the [Matrix] turf has the ability to withstand wear and rain,” said Scott Berry, President of the Grand Prairie AirHogs baseball team. Hellas Sports Construction is scheduled to have the $1.1 million field renovations complete by February, leaving plenty of time for practice before the AirHogs season begins in May.